Open or close your garage door without using a remote control or key. The Liftmaster 877LM Standard Wireless Keypad Keyless Entry System can open the door using a private 4-digit code you program directly into the unit. You can also program it with temporary access codes for visitors or delivery and service personnel so they can gain access to your garage without having to give them your personal code. Security+2.0 rolling code technology assures a new code is sent every time the keypad is used. Temporary password option enables visitors or delivery and service personnel to enter the garage without giving them your personal code. One-button-to-close feature makes it easier than ever to close your garage door (works with all LiftMaster® garage door openers manufactured since 2006). 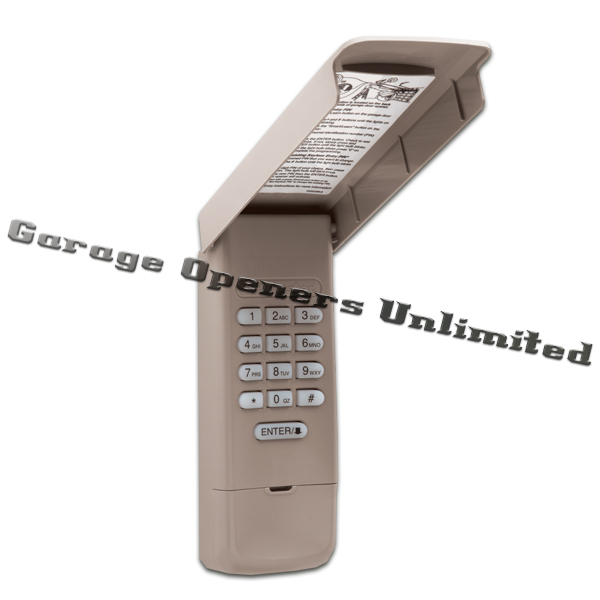 Liftmaster 877LM Standard Wireless Keypad is compatible only with LiftMaster® Security+2.0 garage door openers. For use with Security 2.0 Garage Door Openers. All Security 2.0 Garage Door Openers have a yellow Learn button and two yellow antennas. and ENTER button are pressed on the Keyless Entry. Install the battery and program the Liftmaster 877LM Standard Wireless Keypad Keyless Entry prior to installation. Make sure the garage door opener has a working light bulb because it is a programming indicator.